Even though the conference is over, doesn't mean the networking is. Follow the hashtag #PAWCon to stay connected. 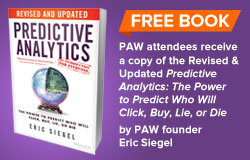 Looking for more Predictive Analytics? Check out our portal, The Predictive Analytics Times. The agenda for PAW Business Chicago covers hot topics and advanced methods and applications such as agile analytics, attribution, avoiding bad science, B-2-B, bayesian networks, deep learning, election analytics, insurance, market mix modeling, market research, model deployment, modern data challenges, predictive salesforce, price optimization, project management, sales forecasting, thought leadership, uplift modeling, workforce analytics, and other innovative applications that benefit organizations in new and creative ways. Join PAW Business and access the best keynotes, sessions, workshops, vendor exposition, expert panel, networking coffee breaks, networking lunches, reception, brand-name enterprise leaders, and industry heavyweights in the business.